A Class II medical device, the WalkAideTM, available exclusively through SPS, uses advanced sensor technology and software to restore functionality to patients with foot drop. The WalkAide System analyzes the unique movement of the leg and foot and creates a unique stimulation pattern for walking, then sends appropriate functional electrical stimulation (FES) to the common peroneal nerve as it passes near the head of the fibula. This stimulation activates the muscles that dorsiflex the foot at the appropriate time during the gait cycle, producing a much more natural, efficient, and safe walking pattern. Registration for one of the 2007 SPS WalkAide Certification courses is available. The latest step in bionic technology, Ossur's PROPRIO FOOTTM offers unparalleled functionality that features active plantarflexion and dorsiflexion movements allowing for maximum toe clearance and calibrated alignment. The two-button control system makes operation and set-up simple and easy to use. 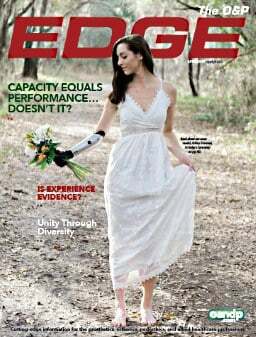 The PROPRIO FOOT is an artificially intelligent and motor-powered prosthesis that helps to replace the function that the bodys central nervous system would normally play in processing information about changes occurring inside and outside the limb if it were still intact. Orthofeet introduces attractive stretchable shoes that are designed for patients who need extra protection, but do not want to compromise on the appearance of the shoes. The non-binding elastic upper provides a loose fit at the forefoot and allows the shoes to stretch and conform to the contours of the foot, eliminating pressure on diabetic feet with lesions, poor circulation, and edema. The smooth lining construction provides superior comfort and extra protection. The shoes are made of synthetic materials and can be washed in warm water. Orthofeet stretchable shoes are available in four widths, including Womens extra, extra wide and Mens narrow. 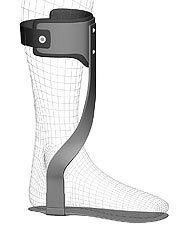 South West Orthopedic Designs debuts a new addition to its ankle brace line: an AFO designed for patients suffering from Charcot-Marie-Tooth disorder. The South West Charcot AFO provides a new option for practitioners with Charcot foot patients. The benefits include: complete P-Cell® lining, removable inlay, total contact environment, heat adjustable, reinforced carbon fiber, and additional PPT padding. The South West Charcot AFO is available in black, white, green, and beige with choices of birdeye knit or leather-like fabric. All South West Orthopedic Designs braces are backed by a one-year full warranty, and free shipping with a five-seven day turnaround is currently offered. The new TrailblazerTM Foot by Ohio Willow Wood is a high-activity, lightweight foot that weighs only 350g and requires clearance of only 6.1 cm. It features a Compound Spring SystemTM that maximizes the effectiveness of the toe springs while maintaining long-term durability. Made of unique composites, the foot provides increased deflection and dramatic energy return. 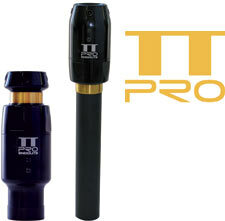 Its innovative PerforMaxTM Heel includes three heel spring options for effective, easy, in-office customization. 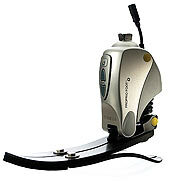 The Trailblazer foot has a fixed titanium pyramid or a rotatable titanium pyramid for alignment. It comes with a high-activity foot shell with extra sole reinforcement for increased durability. The EZ Stride composite has helped thousands of patients enjoy the freedom of walking without restriction. Now, more patients are candidates to enjoy that freedom with the new EZ Stride-ATB (Anterior Tibia Brace), applicable to foot drop patients. This AFO effectively assists the patient return to a more normal gait cycle while minimizing pressure on the tibia. The EZ Stride-ATB, a dynamic floor reaction device that is stronger, lighter, and thinner, is designed to prevent excessive "push out" of the shoe. The EZ Stride-ATB can be fabricated as a lateral or medial support strut, prefabricated, custom to cast, or custom to measurement. SADMERC-approved L-1932. 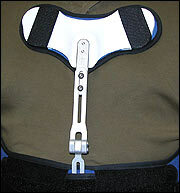 HOPE Orthopedic has added a new, improved feature to its spinal-orthotic ExtenderTM: Adjustable Extensive force. 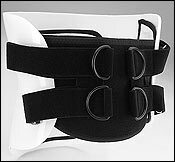 Like the standard Extender, the Adjustable Extender is available with pectoral or sternal top plates, black or white straps, and can be fitted to HOPE Orthopedic's OrthoLuxTM, VertaLuxTM or SpinaLuxTM orthoses or retrofitted to any body jacket. Now, with two quick twists of the Allen wrench provided, the Extender's spinal extensive force can be increased or decreased--no bending required! Same-day order fulfillment until 8:00 PM Eastern, three-day shipping for the price of ground, and a flat fee of $20 for overnight shipping of the HippO or OrthoLux. 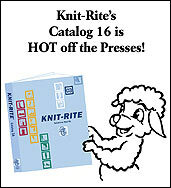 Knit-Rite's latest product reference, Catalog 16, includes the broadest range of both textile and distribution products in Knit-Rite's 83-year history. For the company's manufacturing division, the catalog includes several new textile innovations, including the AK Dressing Retention Sock, Proximal Soft-Sock, Silver Sheath, and Power Pull Sock. All Knit-Rite products also are available through major industry distributors. The company's distribution line also has expanded by adding new manufacturers lines, such as Allard, Alimed, Cybertech, RCAI, Wheaton Brace, and WBC Industries, along with numerous new product additions from long-term lines such as Aetrex, ALPS, Aspen, Becker, Fillauer, Jerome, Ohio Willow Wood, Silipos, TiMed, and Trulife. Designed to meet the needs of upper-extremity and pediatric amputees, the Mini G-Lock from Ohio Willow Wood has a pin locking mechanism with pin seal. The design of this small lock allows a user to secure the locking pin in place at the nearest groove. The Mini G-Lock can be used in both exoskeletal and endoskeletal prostheses and should only be used with laminated sockets. It comes standard with two 38mm pins. One- year warranty from purchase date against defects in material and workmanship. Weight limit: 132 lbs. (60kg). The Endolite Smart IP Knee, now available through SPS, is the first knee to employ intelligent programming technology to dynamically program optimum swing settings according to individual user preferences. 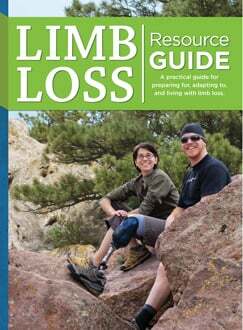 At any time, the wearer can re-program the knee for specific activities or conditions--ranging from a rigorous uphill hike to a change from hiking boots to dress shoes. Endolite's Smart IP optimizes energy efficiency by allowing the amputee to select an optimal program for individualized activities. Clinical studies have shown that intelligent swing control reduces the amount of energy expended by transfemoral amputees in comparison with standard pneumatic controls with fixed settings. ShearBan® is an ultra-thin interface that creates a lowfriction surface in footwear, an orthosis, or prosthetic socket, where rubbing is causing a problem. It also can be applied proactively to areas where you think problems might arise. ShearBan has been shown to reduce friction by an average of 70 percent as compared with commonly used cushioning material. Cascade is pleased to distribute for Orthoservice AG, a dynamic and innovative Swiss company with a wide range of high-quality, value-priced orthopedic bracing solutions. Now in stock are the PlusPoint knee brace and NHYCO hyperextension brace. 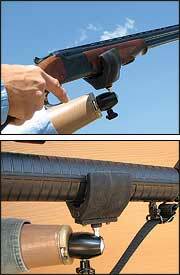 The PlusPoint low-profile functional brace utilizes a four-point dynamic leverage system. It features an anatomically pre-molded ultra-light frame, five extension and four flexion stops and numbered straps. Weighing only 700g, the NHYCO spinal brace adjusts telescopically without removing screws, ensures consistent lumbar pressure, and features an easy-to-use safety lock closure system.